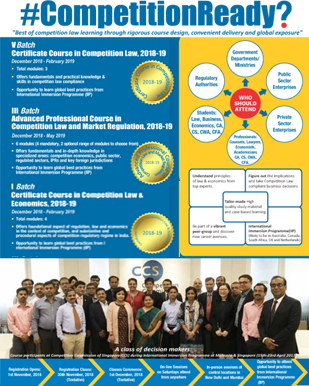 The 6-month Advanced Professional Course in Competition Law and Market Regulation (APC), an add-on course to Certificate Course, aims to offer deeper view of advanced issues including Economics for Competition Law, Joint Ventures, Structuring Complex Agreements, Multi-Jurisdictional M&A filings, IPRs, Public Sector, Regulated Sectors, Foreign Jurisdictions, etc. The APC has been designed for professionals, who wish to develop specialization in competition law and market regulation or looking to re-skill or move into specialized areas. The course entails the study of Modules 1 to 4 and 2 other optional modules to be selected by the participants from the additional modules during January 2019 to July 2019.